Right now I’m planning a few fun trips for spring that will take me from cold weather to warm real quick. I always like to have a few transitional pieces on hand for traveling so I can look appropriate no matter the forecast! It doesn’t hurt that these are under $100 either. That’s not all! Scroll through the photos below for 15 additional wardrobe staples under $100 – click to shop! Great roundup! Thank you for sharing. I love the reversible tote! 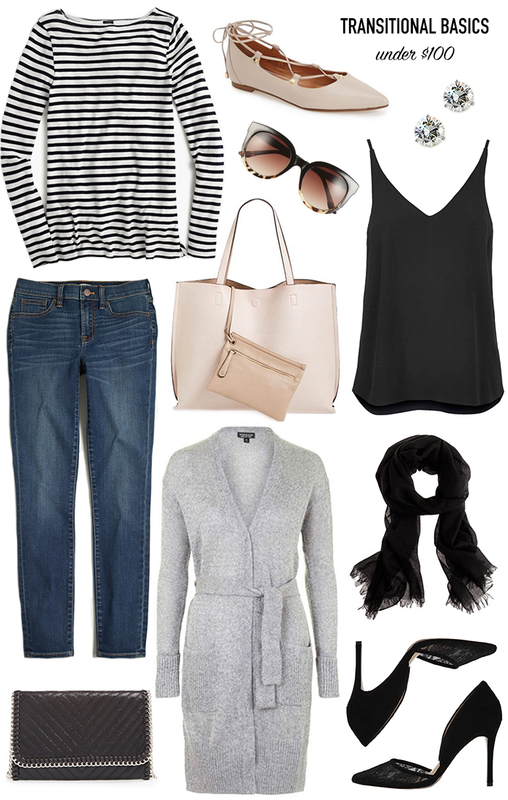 That grey cardigan is just the thing to keep toasty this Winter! Ugh everything is so chic :D <3 I like the clutch and sweater! I love this! All these pieces are really great. ooh that cardi looks so cozy!